This magnificent Manjushri Buddha statue has been crafted from brass, and has been given gold (24 Karats) plating. 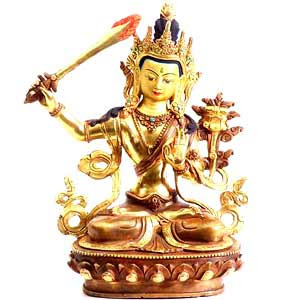 The Sanskrit name Manjushri means "gentle glory" or "sweet glory”. In Buddhism, Manjushri is the Bodhisattva (Buddha-to-be) of Wisdom. He bestows intelligence, wisdom, and the power of eloquence and memory. Revered as the patron of arts and sciences, he is traditionally invoked by writers. He holds a sword that vanquishes ignorance. Manjushri's sword is also considered a sword of quick detachment and a symbol of enlightened will. This statue embodies the finery of traditional artistry and is the repository of oriental religio-cultural beliefs.